By definition, a trend acknowledges a movement in a general direction. Here in Colorado, residents have moved towards enjoying the space outside their home. Take advantage of these trends in your landscape for another reason to step outside. Outdoor Living: Bring the beauty of your home to the outdoors by extending your living area outside. Complement your home by bringing design elements outdoors with a new patio or fire feature. Return to your youth with an adult tree house or repurpose a storage container to create a backyard studio. Whether you entertain or utilize the space for artistic expression, ensure your landscape fits your needs. Landscape Technology: LED lighting or dimmable lights allows you to control the mood from your mobile device. You can also integrate additional controllers like heating elements, an outdoor sound system and smart irrigation controllers to put the power in the palm of your hand. Edible Gardens: Your hands can be responsible for your meals whether you have a large yard or an urban rooftop garden. Consider trying your hand at gardening and grow your herbs and vegetables. Find a sunny place and build raised garden boxes, place containers or even carve out a small space in a planting bed to create an edible garden. Gardening is green, calming and easy on the pocketbook. Updated Planting: Your garden space can be planted with a color scheme in mind, mixing tone-on-tone to create a fresh look. A container garden can be planted for holiday décor and a pop of seasonal color. 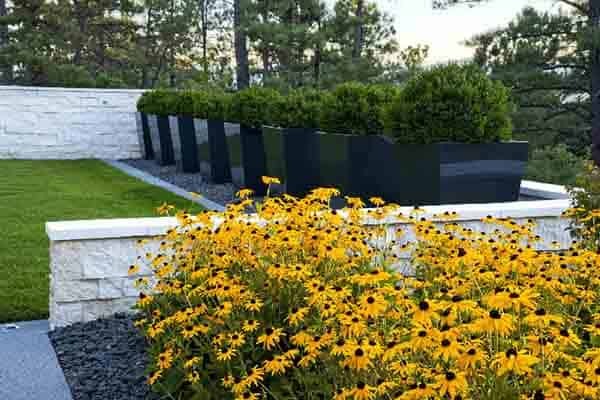 Plan for our four seasons of weather by selecting plantings that provide textures, colors, and evergreen for year round interest. Modern/Contemporary: Pairing a fountain and a fire pit creates the foundation where mass plantings emit either mystery or harmony. Use raw materials like corten steel or board from concrete to offset and bring a modern edge to your space.